Insurance in blackjack should be classified as a sucker bet. It is also classified as a side bet, available in most games of 21. It is offered when the dealer holds an Ace as their up-card. The bet is only open before the dealer checks or draws the hole card. For players not holding a natural blackjack, if insurance is taken, they must place an additional wager equal to half of their original wager. If the dealer goes on to draw a card valued at 10 to make blackjack, the insurance bet is paid out at 2:1. For players who are holding a natural blackjack, they may also take insurance (called maximum insurance). Here the player forfeits the 3:2 payout for a winning blackjack hand in place for a guaranteed even-money (1:1) payout, regardless of what the dealer has. The reasoning behind insurance bets is when dealers have a visible Ace card, chances of them drawing a ten-valued card is just less than one in three, so this side bet ‘insures’ against the possibility of such an outcome, to make up for the inevitable loss/push. Picture this: the dealer is showing an Ace. Your hand, in comparison, is terrible. You’ve already had a few hard losses and don’t fancy losing another round. Suddenly, the dealer asks you if you’d like to insure your bet. You already have a good hunch he/she is going to draw a 10 or face-card to make blackjack, so this sounds like a good way out. Or this: the dealer has a face-up Ace but you have a two-card natural blackjack. The 3:2 payout for your blackjack is mighty tempting, but if the dealer also draws a 10 and makes blackjack as well, taking a guaranteed win with maximum insurance, rather than risking a push, sounds like the best move. At first glance, insurance bets do seem like good side wagers. They sound like a safe back-up plan in an intense game of blackjack, where a dealer two-card natural seems likely. And the way many blackjack dealers describe the bet makes it seem the best and most logical move you can make in the dreaded situation of a dealer face-up Ace. Unfortunately, this is an illusion and the casino is the only party who will ever make money from such a bet in the long run. 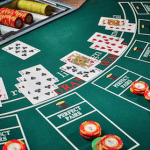 Don’t let yourself be fooled by the way casinos word it or how other players may recommend it, whatever reason they try to offer: place your bets elsewhere. “Insuring weak hands is necessary,” or “it is only half of your original bet;” such rationale is based on the wrong sort of game-play logic. If you are relying too heavily on intuition or superstition to govern your hands, it’s likely you won’t be winning in the long-term. From one blackjack enthusiast to another, steer clear of insurance bets: it’s almost always a wasteful bet. We are going to explain to you what insurance bets really are, show you the odds behind the bet, and analyse a typical game of 21 to illustrate why it is a sucker’s bet. As a side bet, insurance bets have nothing to do with the cards we have. While an insurance bet is commonly thought of as a wager which ‘protects’ us in the case of a dealer blackjack, in actuality, it is simply a side wager on the dealer having/drawing a natural blackjack, and nothing more. Taking insurance while your own hand is a two-card natural (maximum insurance), or a crappy 15, makes no difference, because it has no bearing on it. Let us assume we put down a $10 bet, are not dealt blackjack, and the dealer shows an Ace. If we take insurance, half of our original bet ($5) is put on the table to be used as insurance. Now we can’t win both bets, so already we know one of them is going to be a loss. If the dealer’s shows/draws a King as his/her second card, they have blackjack. This means we win $10 (get back a total of $15) from our insurance bet. But we’ve also lost our original wager of $10 because the dealer beats us with blackjack. So we have broken even in the end. Examining the alternate outcome of the dealer’s hand, let’s say the dealer does not hit blackjack. This means we lose our insurance bet of $5, and play out our initial hand of $10. If we win, we make a $5 profit, is we lose, we lose $15 for the round. but it is essentially a wasteful side-bet in the long-run. Looking at the outcomes this way, you’d rather opt for a $10 win or $10 loss when the dealer holds an Ace, as opposed to a maximum win of $5 and a potential loss of $15, not just in the long run, but in the short-term too. Additionally, in every full 52-deck of cards, four out of every 13 cards are worth 10 points (in blackjack); the cards which would lead to a dealer blackjack after showing an Ace. If you hypothetically wagered $10 as an insurance bet every time the dealer showed an Ace to ‘insure’ yourself against the worst possible outcome (let’s say 13 times), on average, you would win four of the bets (a profit of $80 with a 2:1 payout), and lose the other nine bets (loss of $90). The house gains $10, and you lose more money in the long-run. This demonstrates the basic explanation as to why, in the long run, insurance is wasteful and you’d be much better served not taking it. The following sections drill further to explain the high house edge of insurance bets. While no casino bets have payouts which are true reflections of their exact winning odds, as that would eliminate the house edge, it is important to note the differential between the payout and the actual winning odds (which is the number of ways of winning against the number of ways of losing), as this accounts for the house’s advantage. 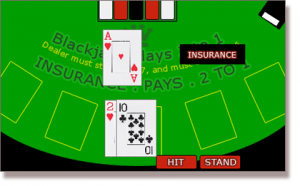 The payout of a regular insurance bet (when the player is not holding blackjack) is 2:1. A typical 52-card deck on an insurance bet play (only one player v dealer) has 49 unseen cards and three seen cards at the start of the game (dealer’s Ace, and player’s two cards). 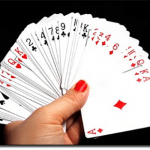 If we begin with the assumption our hand does not contain a 10-value card, then there are 16 cards worth 10 points in the deck, and 33 other cards. 1/ We have no 10-value cards in our hand: there are 16 ten-value cards in the deck, and 33 other cards. So to get the actual odds of winning the insurance bet, we divide 33 by 16, which equates to 2.0625 to 1. So if all was fair in the casino world, we’d actually receive a 2.0625 to 1 payout, or approximately $20.60 from our $10 bet. But as the house needs to profit, this is not possible. 2/ We have one 10-value card and a card that is not worth 10: there are only 15 ten-valued cards remaining, and 34 others. 34/15 works out to be actual winning odds (chances) of around 2.2666/1; so ideally we’d like a 2.2666 to 1 payout, or approximately $22.60 from our $10 bet. 3/ We have two ten value cards in our hand: This means there are only 14 ten-value cards remaining and 35 others. Divide 35 by 14, and we get odds of 2.5 to 1; so ideally, $25 we would like to receive from our $10 bet. This is thus the worst possible hand to take the insurance bet (even though you should not take it at all), because the odds are so out of our favour. Only with one deck and when the player is holding no 10s, is the house edge for insurance below 3%. It sky-rockets after that. Many players argue on other sites, books and forums that when the shoe has more ten-valued cards than usual, insurance is a great way to make sure you cover potential loses and quite possibly earn a healthy payout. Yes, ultimately this would make sense if we knew when to take it, but the only way any player can know when such an ideal situation occurs is if you know how to count cards. Essentially, while many players fall for insurance bets, they aren’t profitable or wise, and have no bearing on our hand. Many players will also take maximum insurance with a two-card natural hand, rather than risk a push, but this is more disadvantageous in the long run, since the Ten in the player’s blackjack means it is less likely the dealer has blackjack. Insurance is taken far too often. Remain informed about its lack of tactical advantage or logic before playing. And besides, if you take insurance every now and then just because you have a hunch, you are playing on instinct, which is a dangerous method of play in blackjack, as you are abandoning basic blackjack strategy. We can play our hand based on the assumption the dealer has blackjack, but don’t insure, as the odds are very much against us.